Pajero (NM,NP) 2000-06. Nimbus UF 1992-2003. Magna 1996-2005. Colt 2004-08. Outlander (ZE, ZF) 2003-06. Mirage CD 1996-2003. - ISO Connector to suit the following Mitsubishi models (refer to installation diagram). Suits all latest 2005 onwards Kenwood car audio units. PICK UP AT DEER PARK (VIC). SCHEDULE PICK UP. Most recent donors. OUR DONATIONS. Aerpro APP8KE1. Peak Power: 8000W. Rated Power: 4000W. Model: 12V-220V 4000W. 1 x DC12V 4000W Power Inverter. •Modified waveform output. Wave form: Modified sine wave. Peak efficiency: >90%. •High conversion efficiency, smart soft start function. CRV 1999-2006. S2000 1999-2010. Integra 1999-2001. Prelude 1999-2001. (refer to installation diagram). Civic 2000-2005. Jazz (GD) 2002-2008. - ISO Connector tosuit these Honda models. (With DC to DC converter and fuse equivalent to 5A. Travelling in a car, boat or caravan?. to DC 32V after testing). DC 12V-24V Car Cigarette. Auctiva's FREE Counter. Input Cable length: 1m. Output Cable length: 2m. Dual USB produces max 5V/3.1A output current. Port:Dual USB Port. USB output:5V 3.1A. Output power:120w. We will be glad to reply and help you to solve any problem. We will answer or help you to solve the problems as soon as we can. Description : Specifications: Item type: Cables, adapters & sockets Voltage input: DC 12V Signal-to-noise: 95DB Max. current: 600mA Frequency response: 20HZ-20KHZ Working temperature: -10-80 Celsius degree Total Harmonic Distortion:0.01% . Kenwood 2017 to ISO harness patch lead. PICK UP AT DEER PARK (VIC). Most recent donors. OUR DONATIONS. SCHEDULE PICK UP. Navara (D21, D22) 1995 . Skyline (V35 350GT) 2001-2006. 300ZX (Z32) 1989-97. Patrol 1995-2004 (MY03). Murano (Z50) 2005-08. Maxima (A33) 1999-2003. (refer to installation diagram). - ISO Connector to suit most Nissan models such as. 100% brand new and high quality Short-circuit protection DC 12V/24V using only. Runs multiple accessories at one time. Convenient to charge your device while driving. Portable, light weight, compact size design. Keep voltage steady to prevent devices from overcharging. The power indicator LED can show the power to be put through clearly. FITS ALL BA/ BF/ FPV/ TERRITORY VEHICLES WITH OR WITHOUT PREMIUM SOUND OPTION, FITS SEDANS, UTE WAGONS FROM XT TO GHIA AND TERRITORY. Audio Aux Adapter - 3.5MM AUDIO JACK USB x 2 CHARGING PORT. Integrates into your existing AUX input -. Specification: USB charger (LED) As long as the phone has Bluetooth, you can connect to the Audi audio One button switch the U disk and Bluetooth mode, red and blue lights indicate the status Bluetooth mode, after the successful pairing of the phone and Bluetooth, you can choose music playback on your phone, and the car audio can be played U disk mode, as long as the U disk has songs files, plug in this line of USB interface can be, the car audio can play Supports pairing two smart devices at the same time . Features:Designed with enough amount of smoke, provided you the constant smoking experience.The first choice for smoking cessation.Designed with the good taste, let you feel better.A rechargeable electronic cigarette, is very durable.The texture of the smoke can be adjusted more carefully.Descriptions: Suitable for the smoke beginner.Designed with adjustable power, meets your different requirments. Without burning smoke, is more environmental protective.Specifications:Brand:JomoWattage: 18-40W Auto-adjustVoltage: 4.2-5V Auto-adjustBattery Capacity: 2200mAhResistance: Support Min.0.5ohmBattery Size:4*2*7.3cmPackage Size:13.5*8*3.5cmColors:black, blue,gold,silverMaterial:aluminium alloy&zinc alloyPackage Included:1 x Lite 40 Battery1 x. Using:A head of inserted into the cigarette lighter socket, on the other end into the audio jack. The line's length is 2M. Far North WA, Far North QLD, NT. Input current:1000mA. Renogy Bluetooth FM MP3 Player Transmitter. The car FM transmitter works with iPhone, iPad, iPod, tablet, Android phones or any other devices with equipped with Bluetooth function. Switch from music playing mode to hands-free mode automatically when receiving calls. Car AUX adapter can be easily installed and used, simply plug in the USB disk/SD card or for iPod/iPhone. It provides direct audio interface to the car stereo via the CD changer port. 1 Car AUX Adapter. For Ford Falcon. Features: AUX Port, USB Port. -Perfect to replace worn out audio AUX cable. 1x AUX Adaptor Harness. For Ford Territory SX-SY (Ghia, Turbo, TS, TX etc). Type: Auxiliary Input Adapter. This is professional customised made and patented product. Suits KMM-203, KMM-BT303, KDC-110U, KDC-210U, KDC-BT510U, KDC-BT610U, KDC-X7100DAB, DDX4017BT, DDX717WBT, DDX7017BT. Kenwood to ISO harness 16 PIN for 2017 headunits. Most recent donors. OUR DONATIONS. Ford BA & BF Falcon / Territory Auxiliary adaptor lead. Works with all Ford BA's BF's and Territory's (Premium Colour Screen version and LCD Display). AU Extendable Car Wheel Brace Heavy Duty Nut Wrench Sockets 17/19mm & 21/23mm. Subaru Antenna Adaptor Subaru factory antenna plug to aftermarket radio This part works in these Vehicles : Subaru Forester 2008-2012 SH Subaru Forester 2013 - SJ Subaru Impreza 2007-2011 GE, GH, GR, GV, WRX Subaru Impreza 2012 - GP, GJ Subaru Liberty 2009-2014 BM, BR Subaru Outback 2009(MY10)-2014 Subaru XV 2012 -. Nissan D/Diversity lead This part works in these Vehicles : Nissan 200SX Silvia S14 SI 2 1995-1999 Nissan 300ZX (Z32) 1989-1997 Nissan 350Z (Z33) 2003-2008 Nissan Maxima (A32) 1995-1999 Nissan Maxima (A33) 1999-2003 Nissan Maxima (J30) 1993-1995 Nissan Murano (Z50) 2005-2008 Nissan Navara 1987-1992 Nissan Navara D21, D22 1992-2006 Nissan Pathfinder 1988-1995 Nissan Pathfinder WX, WXII 1996-2004 Nissan Pathfinder R51 2005-2012 Nissan Patrol GQ, GQII 1988-1999 Nissan Patrol GUI, GUII, GUIII 1997-2004(MY03) Nissan Pintara Sedan & Superhatch 1989-1992 Nissan Skyline V35 350GT 2001-2006. Features: 100% brand new and high quality. High converting efficiency. Under voltage shutdown protective. Overload protective, overheat protective. Low battery alarm, low / high battery shut down. Protect the electrical and automotive circuits in use. Can be operated with your car cigarette socket or direct connected with wires clips. Adapting Aluminum Alloy case, antioxidant, sturdy and durable. . Features: Supports overload, short circuit, overtemp, reverse polarity, under/over voltage protective for safe usage. Built in cooling fans enhance working time for long service life. 2000w pure sine wave power inverter with LCD. Dual display design. 1 X RCA Convert cable. Plug type:RCA. for Toyota. Cable length:20cm approx. Plug and play. Detail Image. 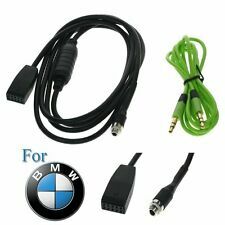 MAZDA AUX/iPhone/iPod Interface Cable SKU : AUXIP5_MAZ Use this Interface cable to add MP3 Music to your existing Original OEM Factory Radio via AUX Port without the need to upgrade to Aftermarket Stereo which involve buying expensive fascia kit . This interface let you play music via 3.5mm AUX Input . and Charge your iPhone / iPod via Lighting Cable . This part works in these Vehicles : Mazda ( Without Navigation System ) 2 2003-2008 3 2004-2008 5 2006-2009 (without entertainment system) 6 2002-Oct.2003 6 2006-2008 ( will not work on Mazda 6 produced from Nov. 2003 to Sep. 2005) 6 2009 (Panasonic/Bose) Miata/MX5 2003-2008 (non Bose) SPD 2002-2006 SPD Protégé 2002-2003 CX7 2007-2008 (non Bose) RX8 2004-2008 (RX-8 radio firmware version must be v.